Frank Orth and Associates (FOA) have been providing observers for programs in the National Marine Fisheries Service (NMFS) Southwest Region since 1996. Our office is located in Long Beach, CA and the observers will work out of various ports along the Californiacoast including Morro Bay, Ventura, San Pedro and San Diego. 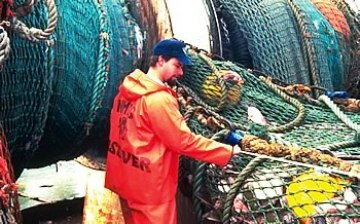 The observers can be deployed on a variety of vessels in various fisheries including; Drift Gillnet, Set Gillnet, Pelagic Longline, Purse Seine, HMS Recreational Commercial Passenger Fishing Vessels, Albacore Troll and Baitboats, and Pot and Trap vessels. While onboard the vessels, the observers are responsible for collecting data on the gear, locations, weather conditions, and catch. NMFS has the authority to place observers on the vessels from the Marine Mammal Protection Act and the Magnuson-Stevens Fishery Conservation and Management Act. Observers collect data on the species composition of the catch including the target species, incidental catch, bycatch, and any sightings or incidental catch of protected species. Including tallying the catch, observers will also take various measurements of many species and various biological samples that the lab requires. Collections have included biopsy samples, shark stomachs, shark vertebrae, swordfish stomachs, swordfish gonads,swordfish gills, swordfish heads, etc. In the event that any cetaceans or pinnipeds are incidentally caught, the observers are required to do an at sea dissection to bring back various samples for the lab. Observing can be a challenging position due to vessel size, fishing hours, and weather conditions but it is also a rewarding position for the opportunity to travel to various ports, gain experience in various fisheries, meet many different fishermen and learn about their experiences, and the opportunity to see, sample and collect a variety of species. If you would like to find out more about the FOA Observer Program, or to apply for a position with the FOA Observer Program, contact: Scott Casey or (800) 522-7622.